In an effort to understand the mechanisms governing pathogenic gut bacteria better, researchers at the University of California Davis School of Medicine inquired why some food-borne bacteria cause severe illness. In the results from their recently published study, the investigators describe how pathogens in the intestinal tract cause harm by benefiting from immune system responses designed to repair the very damage to the intestinal lining caused by the bacteria in the first place. A normal, healthy large intestine is generally free of oxygen, and the beneficial microbes residing there thrive in this anaerobic environment. Conversely, enteric (intestinal) pathogens, such as Escherichia coli in humans or Citrobacter rodentium in mice, need oxygen to survive. 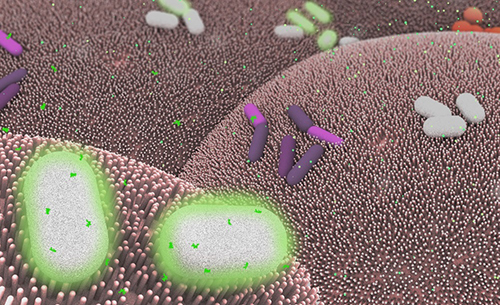 The UC Davis team discovered how these pathogens change the gut environment to favor their own growth. The research that Dr. Bäumler and his colleagues performed has important implications for developing new treatment strategies that target factors that compromise the intestinal lining function or bolster microbiota composition to offer either resistance or assistance to invading pathogens. Just this past year the Centers for Disease Control and Prevention (CDC) identified three drug-resistant organisms—Clostridium difficile, carbapenem-resistant Enterobacteriaceae, and Neisseria gonorrhoeae—as requiring urgent attention. Moreover, in May a report commissioned by the U.K. government predicted that by 2050 antimicrobial-resistant infections could claim 10 million lives a year and cost up to $100 trillion from the global economy. Understanding how gut pathogens thrive and manipulate the body's natural defense mechanisms, while contributing to abnormal states within and beyond the gastrointestinal (GI) tract, is a burgeoning area of research at UC Davis. Scientists from schools and colleges across the campus are investigating antibiotic resistance as well as the influence that gut flora imbalances have on many conditions, including brain health and behavior, obesity, inflammatory bowel disease, irritable bowel syndrome, GI cancers, cardiovascular disease, fatty liver disease, autism, arthritis, and asthma.